When one leaves French Polynesia in Bora Bora you have a basic choice of two directions to go on the way to Fiji. You must pass through the Cook Islands but this group of 15 islands is spread over many hundreds of miles from north to south. You can go through the southern Cooks to Tonga, and then Fiji or through the northern Cooks to Suwarrow, American Samoa, and then Fiji. In either case there additional stops you can wake if your time and inclination allows them. We chose the northern route for two reasons: one is to allow us to get stuff sent to American Samoa through the US post office; the other is reduce the chances of getting really crappy weather. The reason for the bad weather is something called the South Pacific Convergence Zone which is an area between Australia and French Polynesia into which some of the Roaring 40s depressions move northward toward the trades. As it turned out, the northern route was better. Friends who went further south had a couple of gales with winds to 40 knots. We had occasion where we had to deal with winds in the low 30s. South Pacific weather is unique and you really have to pay attention to it. This little guy spent the night onboard midway to Suwarrow. He spend the entire night balancing on the front of the lifeline where it joins the pulpit. His balance improved dramatically with practice. 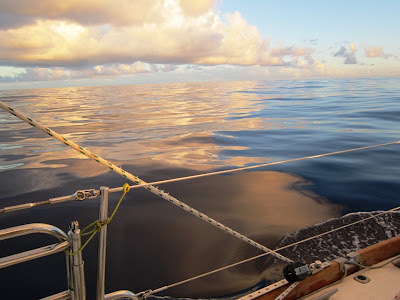 From Bora Bora we finally had some easy-going trade wind sailing. We found that the wind was so far aft we could not have main and genoa up since the main just blanketed the headsail so it was constantly collapsing. Accordingly we went with the genoa only supported by our spinnaker pole. The latter is a beast – I think 17’ feet long and 5” in diameter. It started life as a spin pole for racing and is actually about 2 feet shorter than a whisker pole might be. Generally we need to keep a couple of rolls in the genoa otherwise the sail will collapse a bit as the boat rolls downwind. Fortunately, the pole is permanently mounted on the mast so we never have to support its considerable weight. It is easiest to control with two people, one at the mast and one at the forward end, but one person can do it in stages going back and forth between mast and boat bow. To use the pole, we rig an uphaul (staysail halyard), foreguy (to bow) and afterguy (to midships cleat). We start with the genoa furled and put its sheet in the end of the pole. Then we lift the pole and pull it back as far as possible controlling it with the various lines mentioned previously. After it is in position we can unroll the sail and away we go with perfect control. The boat tends to roll from side to side a bit but in general it is a pretty comfortable ride, although not too fast in the kinds of winds we had from Bora Bora to Pago Pago (we were going to go to Savusavu in Fiji to keep the rhythm going but changed our mind). A number of cruisers use a pole on either side and two sails to go downwind – this looks like a pretty good arrangement but you need a lot of extra gear (2 poles, 2 mast tracks, 2 sets of control lines). With a bigger crew we would be tempted to use our assymetric spinnaker more downwind, but we are not comfortable having it up at night (squalls are a reality here) and we would have to put it up and down for the days and then put up and take down the pole rig with the genoa for the nights. Setting up the pole can take as long as 45 minutes and taking it down half an hour, with spinnaker times not a lot less so it has been tempting to put up the pole and genoa and just leave it there days at a time with perhaps one gybe a day (which takes half an hour +/- each time). We have had a lot of tradewind sailing like this from French Polynesia westward - winds pretty much behind and between 8 and 15 knots. And we have had quite a bit of this too. Notice that we are still sailing in spite of winds of perhaps 5 to 7 knots behind us. Not bad for a heavy displacement boat- thanks Mr Hood. Suwarrow - Anyway, the trip to Suwarrow was a very relaxed and easy one, with one important exception, with the poled-out genny up pretty much the whole time. The exception was that we had a steering cable break. This was more than a little annoying since I had inspected these cables little more than a month earlier, but the cable break occurred in a section of the cable that I could not access to inspect , above the aft cabin berth where one of the cables went from starboard to port. It was not too windy or rough (swells still about five feet though so we decided to replace the cable rather than trying to use the emergency tiller. Fortunately I had spare cable on board for both the steering system and the centerboard with an eye swaged on both ends for attaching to the steering chains inside the pedestal. The steering cable system on a center-cockpit boat is much more complex than with a rear cockpit. The cables go from the base of the pedestal forward to the galley along the boat centerline. They the go to the starboard side of the boat and then inside various lockers almost to the stern. One cable then is led to the steering quadrant of the rudder while the other goes across the boat to a pulley before returning to the quadrant. This meant that we had to empty lockers and remove various teak panels to get access to the system. We then had to disassemble the steering system inside the quadrant before running the new cables. Finally we had to tighten everything up. In fact we had to do it twice since we managed to get the cables crossed inside the bottom of the pedestal. In total the repair took 13 hours. We replaced the other cable later in Pago Pago to be on the safe side. One nice feature of this was that we were part of an informal SSB radio net of boats that were going to Suwarrow, Tonga, or Niue from Bora Bora. We reported in with the problem we were having one day so at least some people knew we had stopped. The next day they wanted to know how things were going and we were happy to report we were back on route again. We were looking forward very much to Suwarrow (also called Suvarov) as many cruisers had raved about it, but we had in the back of our minds that people had raved similarly about the San Blas islands in Panama and we found them to be a disappointment. Suwarrow is an isolated atoll in the Cook Islands that has been set aside as a national park – the populated Cook Islands lie some distance to the north and south of it. It has no permanent population, just two park rangers/wardens who are there for six months of the year. · James and John were very interesting and welcoming people. James, a Maori originally from New Zealand, was remarkably well read on almost any subject and well worth a chat or three. John was very quiet but equally friendly. He went out of his way to give June a parrot fish that he speared the previous night – these two eat a lot of fish and coconuts to supplement what they have brought with them and goodies that cruisers give them add some variety to their diets. 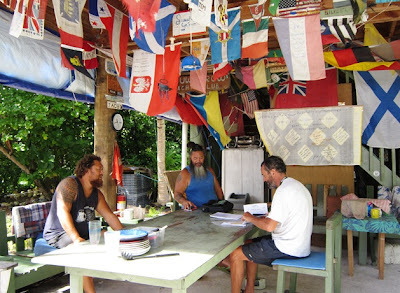 Here we are going through the always interesting check in procedures for Suwarrow (Cook Islands). John is on the left ad James in the middle. This was their outdoor 'dining room' where pot-lucks and socializing occur. · J and J also organize pot luck dinners when there are new boats in the lagoon both for social reasons and to vary their diet. This was a most pleasant evening for about 12 people in total around their table using the various plates and utensils that the caretakers have accumulated over the years. It happened that our dinner was held on Tom Neale’s birthday. Who is TN do you say? He was a Kiwi who lived on the island by himself for 25 years after World War II. He became somewhat famous when a book he wrote about his experience became quite successful. Early in his time there he might get one cruising boat visiting every two years so he really was a kind of modern Robinson Crusoe. His house is still used for storage and there is a memorial stone. Interestingly, there is nothing there about an American family who lived on the island before WWII. They were removed by the US Navy after Pearl Harbor when there were fears that the Japanese might take the island – the lagoon is certainly suitable for anchoring large ships although the entrance might be a bit tricky for anything too big. · The lagoon has terrific snorkelling with remarkably colourful fish along with large numbers of small sharks (black-tip reef sharks from 4 to 6 feet). Each cruising boat seemed to have a few nearby at any time. They would swim lazily around, but if you threw in some food scraps you could see how quickly and violently they could move. We did go swimming around the boat,, for example, replacing a prop shaft zinc anode, after being assured that these sharks were benign – and they seemed to be since they did not come near us when we were in the water. 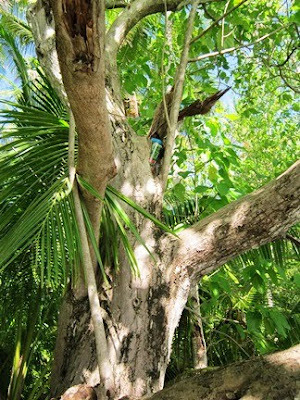 · We even found a geocache on the island that a cruiser had setup in 2009. Geocaching is a hobby/sport that involves finding ‘buried treasure’ using a portable GPS. You can learn more about geocaching at www.geocaching.com. Your handheld GPS will get you close to a geocache but then you have to find it -in this case 12 feet up a tree where a limb had split away. American Samoa - Finally it was time to leave Suwarrow, with considerable regret, and head to Pago, Pago, in American Samoa (AS). We had a relaxed downwind sail to AS, again not too fast. There are two Samoas, one (just called Samoa, although formerly Western Samoa) is an independent nation that used to be a British colony, while American Samoa has been US territory for more than 100 years after having been German colony. AS is quite a fascinating place both from physical geography and cultura/economic perspectives. 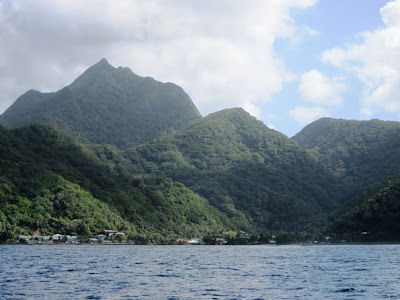 It is a beautiful, mountainous island with by far the largest and best protected harbour in the South Pacific. You enter the harbour, turn left and the harbour extends for another two miles with deep waters surrounded by high mountains. It was an enormously important naval base in World War II when the number of navy personnel there was actually higher than the local population. It also has had more than its share of natural hazards with a cyclone (hurricane) last year and a tsunami in 2009 after an 8.0 earthquake under the sea to the south of the island. The latter devastated the low land at the head of the harbour where we were anchored and left much debris on the sea bottom that can make anchoring tricky as your anchor can get fouled easily. AS is famous for being a hotbed for the development of NFL football players. There are about 30 Samoans in the NFL (some brought up in the US). In fact, the chance of a Samoan playing in the NFL is 50 times greater than that of a non-Samoan. 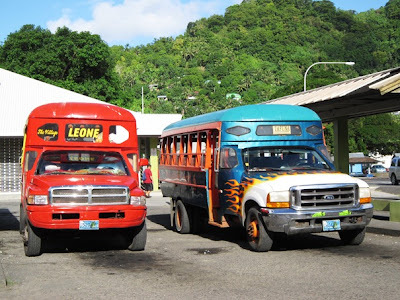 The result is that you see pickups and buses with various NFL team logos on them to make a connection with a friend or relative. The explanation for this is partly size – these are big folks, not necessarily all that tall but very solid looking, lots of men who are 6’ to 6’4” and 220 to 240 (not counting the people who are obese – of which there are many) and very athletic-looking. Pretty much fertile ground for finding linebackers and safeties. Many men in AS wear a traditional wraparound skirt, sometimes with a tie and jacket at the courthouse which makes we think of an old question – ‘what do you call a guy who is 6’3”, weighs 230, has a body fat content of 2%, and wears an attractive floral print skirt?’… ‘Sir’. AS has a couple of other sporting distinctions. Two locals have achieved the highest ranking in sumo wrestling in Japan and AS has the unfortunate record of having suffered the largest defeat in soccer world cup history, 38-0 to Australia. AS has been both blessed and cursed by being linked to the US. The American government could not solve all its financial problems here but they could start. Local Samoans who do work, and many do not, have government jobs of which there are many. Other jobs are done by workers from Samoa (the other one), Tonga, and the Philippines. Stores and restaurants are owned by Chinese and Koreans. The busiest days in the latter are when the government cheques come in. There is one very large tuna cannery in Pago Pago (Starkist) and another (Chicken of the Sea) closed down in the last few years because the government tried to raise the minimum wage to $7.25/hr to encourage more American Samoans to work there. To give you an idea of the impact of this, the closed factory cost 2000 jobs while Starkist also cut 800 jobs – this on an island of only 60,000 people. Of course, most of the workers were from Samoa and went home, but local economy lost all the money that the plant generated. 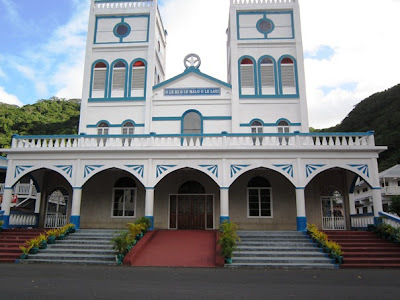 American Samoa has many, many grand churches - this one is typical. These act as the main community centers and are kept in immaculate conditions. The churches do not have graveyards though - people are buried outside the family home, often in quite elaborate and costly tombs. AS has a marvellous system of private buses built on pickup chassis. These are two of the newer, larger ones but many are built on 1/4 ton Toyota trucks. They are handbuilt and the bodies are often made of wood only. Fiji – From American Samoa it was on to Fiji, a trip of almost 600 miles to the southwest. This meant moving further into the converge zone and the unsettled weather this might bring. 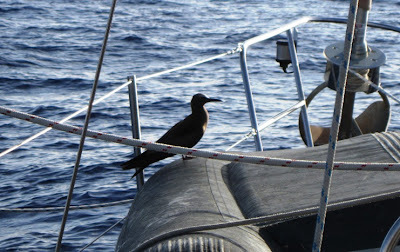 In fact, we had a bit of everything – nice sailing, no wind (motored for almost 30 hours), and too much wind. The latter occurred as we were passing through islands at the eastern end of Fiji in the middle of the night. We had 30-35 knots while we were trying to point high enough to pass to windward of a particular island so we would have a better wind angle for our sail to Suva, the capital city. We managed this but had to hand steer as Morley, the Monitor, likes to swing up and down too much for this sort of sailing. 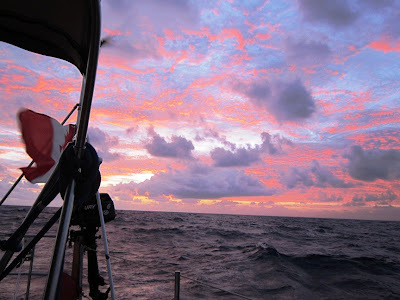 As we approached Fiji, we crossed the 180° meridian and entered the eastern hemisphere for the first time. We now have sailed in all four hemispheres on this trip. This is not the international dateline here as it is further east so that all of Fiji, along with Tonga, are in the eastern hemisphere with New Zealand and Australia which are the economic powers in this part of the world. Fiji is an interesting place and much wealthier than we expected. The downtown is quite classy and sophisticated with excellent restaurants, fine stores, and even a movieplex with 3D flics (we all went to see Captain America since none of us had seen 3D – it was worth seeing and had a nice comic book sensibility). Fiji has an Indian population that is almost as large as its native Fijian population. The Indians were brought here as indentured workers for the sugar cane plantations and have done very well in the last century or so. They are now more urbanized, better educated, richer, and more politically active than the Fijians and this has caused considerable unrest. In fact, there have been three coups des stats here in the last 15 years and democratic government will not be re-established until 2014 at the earliest. The background and events are far too complex to go into here, but basically it all involves relations between the two groups and how much the constitution should reflect the traditional chief-based government of the islands. I get the impression that, while things are perfectly safe and quiet now, the basic problems have not been addressed in any meaningful way. It is fascinating that all this discord has happened in a place where the people could not be nicer and seem particularly gentle. If we have one complaint with Fiji it is with the weather. It has been quite grey and most days have had some rain. This evening we would even say it is quite cool – for the first time since we left the US in November. And this is at 18°S – probably this is about the temperature too. We may leave here in a few days (around August 17th) if we get a break in the weather to go to Vanuatu. This will be particularly interesting as I know virtually nothing about this small country. Suva is the main commercial port of Fiji and demonstrates the large influence China has. On the left is one of the couple dozen Chinese fishing boats that call this home. They have interesting names like 'Lucky 9 Number 6' (as opposed to 'Lucky 9 Number 1' - they are both moored near us. On the right is the a 729 foot satellite monitoring ship whose name translates to 'Distant Looking Number 5', which suggests that there are at least four similar ships. June talked to some of the crew in the market to see if we could go get a tour but while they were friendly to her they had clearly been told not to talk about what they do. It had two immense satellite dishes and many smaller ones along with numerous communication domes. Is this my first spy ship? BTW, occasionally something happens that reminds you that you are long way from home. The other night we went to the Royal Suva YC (not as fancy as it sounds, but very friendly) for a BBQ and to watch a rugby match on the big screen. There were about 100 people there with most cheering on either Australia or New Zealand (the All Blacks won convincingly). Made you realize that most of the visitors here (cruisers or otherwise) are from these countries both of which are not too far away. The yacht club was using this match as a test of their TV system before the rugby world cup which will be held in NZ in a month or so. This world cup is hugely important in this part of the world – up there with the soccer world cup in Brazil or Europe. The yacht club was handing out free jugs of beer (“How many would you like, sir?”) and the BBQ was Fiji$6 (or something less than US$4). These things also remind one that you are not at home. Posted by Bruce at 3:47 a.m.
August 18, 2011 at 7:45 p.m.